On our recent trip to South Africa, Craft Editions had the privilege of meeting with Michael Taylor at his studio in Cape Town. Michael is a well-known South African artist, who works primarily in figurative painting. However, Michael has also started working in ceramics, transposing his painterly style of drawing to unique ceramic pieces. This approach to craft, from the perspective of a fine artist, challenged us at Craft Editions to view his work in this very particular light. Michael initially studied visual communication at the University of Stellenbosch before completing a Masters degree in drawing there. His interest in design pulls through into his ceramic work, where he can enjoy a more sculptural approach. Michael produces hand built works, which often appear roughly formed and bearing marks from the pressure of his hands. Folds of clay often remain visible where they are joined and moulded to form new shapes. This apparently rough finish is set off by the striking painted glaze drawings decorating the surfaces of the white earthenware platters and pinched pie plates. The glazes Michael uses are in a reserved palate of white and deep blue, occasionally punctuated by a splash of red. Michael insists the colour choice is not deliberately similar to the colours in old Delftware, but the comparison is inevitable given the Cape’s historical significance on the 17th and 18th century trade routes. Michael’s decorative images have a characteristic iconography and he frequently returns to the theme of the Lost Boys from Peter Pan. 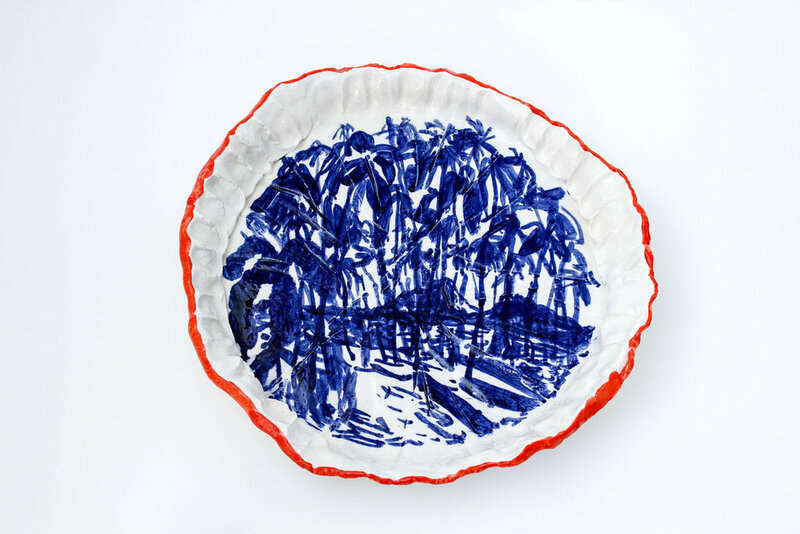 As a result, groupings of Michael’s works, when installed on a wall, appear as portholes into an exotic world of islands, palms and figures wearing wide-brimmed hats. The figures are often painted from behind, looking away from the viewer at something else even more distant and this accentuates the whimsical feel of the pieces. 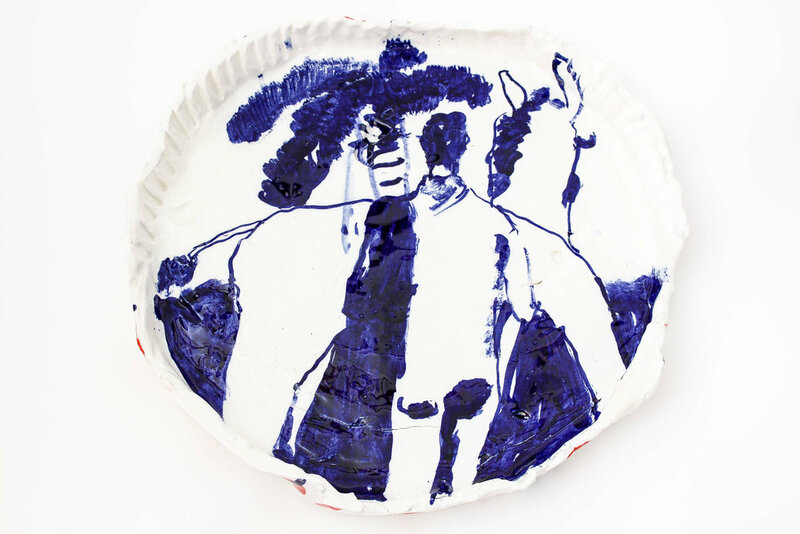 Characteristically, decoration spills over the edges and onto the rims of the dishes, inviting the viewer to engage with all aspects of Michael’s work. Sometimes, words can be found on the decorated rims of dishes, which can accentuate the encapsulated content and lead the viewer to regard the decoration in a new light. Viewing Michael’s ceramics excited us at Craft Editions because they invited us to consider the relationship between art and craft yet again and his works manage to straddle this border with acrobatic elegance. Find out more about Michael Taylor Ceramics here. Images courtesy of Michael Taylor.